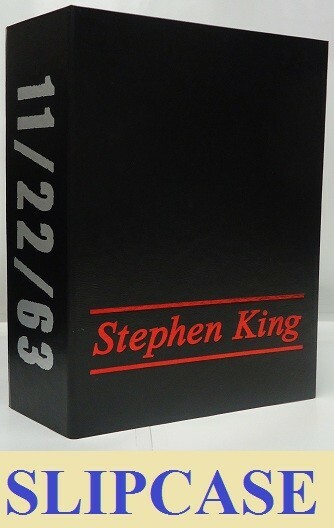 Stephen King's novel, 11-22-63, can now be protected and look great in your home library! This unique slipcase featuring a door with foil embossing! A Unique Slipcase from Stephen King Catalog and the Overlook Connection! Purchased with No Returns at this price. Our slipcase features a DOOR! This folds out as seen here and will protect your first edition. Foil embossed with a Unique Door! Silver foil on the spine. Red foil on the side. All materials used are Acid-Free for complete archival protection. And you will be supporting our store which has been offering Stephen King books and items since 1987! This unique Slipcase is ONLY available from Stephen King Catalog and the Overlook Connection. We appreciate your business everyone! On November 22, 1963, three shots rang out in Dallas, President Kennedy died, and the world changed. What if you could change it back? Stephen King's heart-stoppingly dramatic new novel is about a man who travels back in time to prevent the JFK assassination a thousand page tour de force. Following his massively successful novel Under the Dome, King sweeps readers back in time to another moment a real life moment when everything went wrong: the JFK assassination. And he introduces readers to a character who has the power to change the course of history. Jake Epping is a thirty-five-year-old high school English teacher in Lisbon Falls, Maine, who makes extra money teaching adults in the GED program. He receives an essay from one of the students a gruesome, harrowing first person story about the night 50 years ago when Harry Dunning's father came home and killed his mother, his sister, and his brother with a hammer. Harry escaped with a smashed leg, as evidenced by his crooked walk. Not much later, Jake's friend Al, who runs the local diner, divulges a secret: his storeroom is a portal to 1958. He enlists Jake on an insane and insanely possible mission to try to prevent the Kennedy assassination. So begins Jake's new life as George Amberson and his new world of Elvis and JFK, of big American cars and sock hops, of a troubled loner named Lee Harvey Oswald and a beautiful high school librarian named Sadie Dunhill, who becomes the love of Jake's life a life that transgresses all the normal rules of time. A tribute to a simpler era and a devastating exercise in escalating suspense, 11/22/63 is Stephen King at his epic best. 2011 Overlook Slipcase for 11-22-63. This case is in stock and ready to ship.